With a perfect backdrop of sunny skies and cool temperatures, the Washington Spirit Reserves opened their season in resounding fashion, notching a 4-1 victory over the Braddock Road Stars Elite Saturday afternoon at the Maryland SoccerPlex. Second-half Washington substitute Ashley Cuba scored twice on feeds from teammate Niomi Serrano within a five minute span, punctuating an earlier two-goal lead. The home-side Reserves wasted little time attacking at the onset of the match, forcing Braddock Road keeper Jessie Ferrari to come up big with a sprawling save in the opening minute on a Morgan Reuther shot. The Spirit Reserves continued to pressure the Stars Elite backline and were rewarded for their efforts in the 16th minute. A corner kick opportunity saw defender Sam Lofton curl her cross inside the near post for the unassisted 1-0 Washington lead. As the half wore on, Braddock Road settled in and began to build offensive momentum of their own. In the 30th minute, a splitting pass through the middle found Stars Elite forward Jackie Stengel in on the Washington goal. Her driven shot was tipped just wide from an athletic extension courtesy of Spirit Reserves goalkeeper Adelaide Gay. 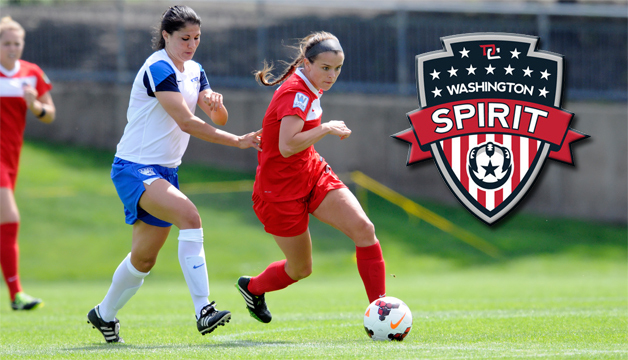 A nifty combination of passes from a trio of Spirit Reserve veterans doubled the Washington lead in the 34th minute. Midfielder Katie Yensen collected a pass deep in the right corner of the Braddock Road box and slotted a quick touch to teammate Ashley Herndon. As defenders converged on Herndon, she one-touched the Yensen feed across the goal mouth where midfielder Kara Wilson buried the shot into the net. Both sides created scoring opportunities throughout the second half of play, but Washington’s substitutes created most of the fireworks. In the 77th minute, defender Serrano found herself pushing forward up the right side before touching a floating pass to an open Cuba up top. Cuba cut quickly left and placed her shot untouched past keeper Ferrari for the three goal lead. The Serrano/Cuba combination paid off again in the 82nd minute when a low crossing pass sent the rookie forward in alone on the Braddock Road goal. This time Cuba drove a rocketed shot home for the 4-0 advantage. Refusing to go quietly, Braddock Road scored their first goal in franchise history in the waning moments of the match. Midfielder Marisa Park intercepted a Washington pass and blasted a low shot to the left corner, beating keeper Gay to get the visiting Stars on the scoreboard in the 89th minute. Moments later, the referee’s whistle solidified the 4-1 final scoreline, earning the Spirit Reserves their first points of the season.